287/365(+1), a photo by Luca Rossini on Flickr. 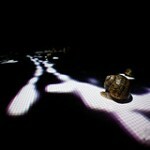 I’ve been asked by Romaeuropa to shoot two more pieces displayed at Digital Life 2012 for the catalogue of the exhibition. They are currently part of the exhibition at the Ex-Gil, an old building by Luigi Moretti, considered to be one the most beautiful examples of rationalist architecture that flourished during the fascism. Compared to the pieces displayed at MACRO Trastevere for Digital Life, here there’s much less video art and more “digital-installations”. One of the pieces I was sent to shoot, Francesca Montinaro’s “Audience”, is a set of fifteen large LCD screens displaced in a half circle, each one hanging vertically and displaying a different person seated, so to create a sort of virtual audience around the spectator. The audience uniformly shows the same “mood” (disapproval, laughing, clapping, etc. ), which is made selectable by a touchscreen placed in the middle of the room. Now, the room itself was quite small, and the people in the screen were constantly moving, so it was impossible to get a panoramic shot (at each different shot I would have got a different expression from the monitors). Sure, I could have shot each screen separately and then stitched them all together later, but I felt that the approach wouldn’t have respected the intention of the piece. Using the 16mm e-mount with the fisheye adapter not only I could get in one shot all the screens (and hence all the people performing one of their actions), but also I got a view of five screens with the “correct” perspective: the screens were displaced in a convex space, while the fisheye represents the world as a concave space, so there is a point where the to spaces “neutralize” each other into a “normal” and plane space. The other piece I had the honor to shoot was Daniele Puppi’s “Cinema rianimato”, basically a movie which has been re-mastered to “adapt” to and “play” with the existing architecture. Again, I won’t publish here any of these shots, since I prefer them to firstly appear on the catalogue. However, I took a couple of shots of another piece, one that hit all of my buttons, the artistic, the photographic, and the scientific ones: Quiet Ensemble’s “Orienta: è quì ora, che decido di fermarmi”. On a huge screen a bunch of snails are left free to wander around. Their trail, however, is sensed by the screen, which lights them on. 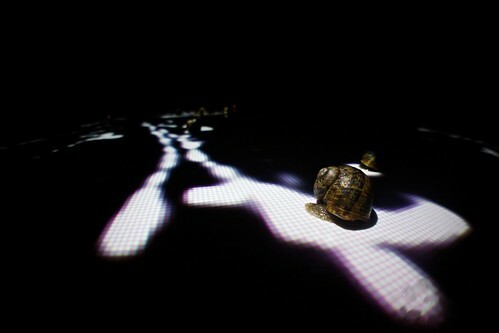 After a while, the piece becomes a weirdly organized random pattern of light trails on a black background, with the snails barely lit by their own trails. It’s a strongly metaphorical piece, somehow we, as humans, are able to read the present and the past of the unaware snails. Are we leaving similar trails and is there any being in the universe able to read them?